According to the close association of type V solar bursts with type III bursts, we propose that solar radio type V bursts are excited by the electron cyclotron maser instability. The work by J. F. Tang, D. J. Wu and C. M. Tan has been published in the Astrophysical Journal (2013,779,83). Solar radio type V bursts are closely associated with type III bursts and usually follow certain type III bursts or burst groups. They have a longer duration (a few minutes) and a wider spectrum (more than 100MHz) than the preceding type III bursts. The degree of circular polarization of type V bursts is low and they usually have the opposite sense of polarization from that of type III bursts. However, type V bursts have the similar observed characteristics with type III bursts. They have an approximately equal source height and the same dispersion of position with frequency. Based on the observed features of type V radiation and the preceding type III bursts, we present that the type V bursts have the same coherent emission mechanism as that of the associated type III bursts. 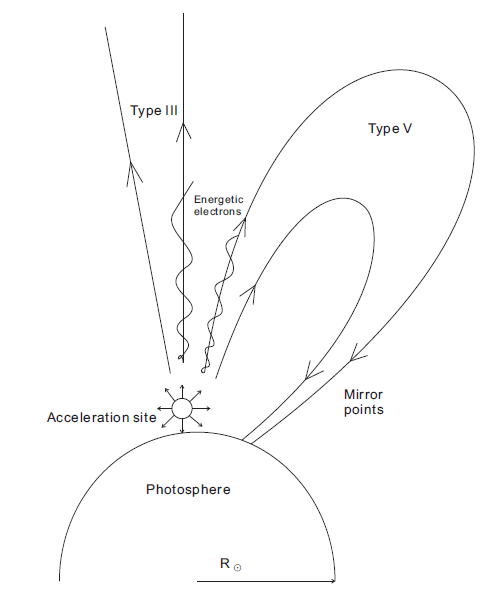 They are excited by the energetic electrons with velocities ~(1/3c) originated from a common acceleration site. Part of the energetic electrons propagate along the open field lines and drive the maser instability and give rise to type III bursts. The remaining energetic electrons are guided along one leg embedding in the acceleration site and are trapped in the arcuation due to the mirror effect. These trapped electrons can excite cyclotron maser emission and produce type V bursts (see Fig.1). Fig.1 Proposed configuration of source regions of type V solar radio bursts. The coronal loop is adjacent to the open field lines which are traced by type III electrons. It is suggested that the energetic electrons trapped in the loop excite cyclotron maser emission and produce the type V continuum.